Due to the maturity of the economy and the fact that the Japanese population is decreasing as a result of the declining birthrate, we can no longer expect significant economic growth to take place in the domestic market, and therefore need to promote further globalization. Non-Japanese employees have different ways of looking at things and active attitudes toward work, and as such, they are expected to have positive effects on other personnel. As a result of implementing measures such as holding job fairs to provide information on our company targeted specifically at foreign students studying in Japan and conducting recruiting activities at overseas universities, as of December 31, 2017, foreign nationals from nine countries have joined Nabtesco’s workforce. We set the goal for the ratio of non-Japanese new graduates hired for managerial positions to around 30% each year. However, recently it has been difficult for us to recruit new graduates from domestic universities. Accordingly, we will try to employ graduates from overseas universities in the future. * The calculation scope covers only Nabtesco Corporation. The figures are based on the human resources data. To promote employment of female employees, we hold job fairs specifically for female college students. At these job fairs, we provide students with an opportunity to directly hear the voices from the female employees about their experiences, available childcare schemes, and work-life balance. Thus, we had achieved the goal of maintaining the ratio of females among new graduates for managerial positions at no less than 20% each year up to FY2016. In FY2017, however, it went under the goal due to the scarcity of female graduates who majored in mechanical engineering and electrical/electronic engineering, who are our primary recruitment targets. Going forward, we will continue to uphold this goal and continue our efforts to recruit female workers. Nabtesco has established three action plans pursuant to the Act on the Promotion of Women’s Participation and Advancement in Workplace (enforced on April 1, 2016). We continue to make efforts to implement these action plans. * The culculation scope covers only Nabtesco Corporation. The figures are based on the human resources data. Nabtesco’s continued employment system provides a consolidated environment for experienced employees to maximize their performance levels, such as special benefit for those with advanced expertise. Due to the revision of the National Pension Act, the rate at which Nabtesco re-employs retired employees will further increase beyond the present level of over 70%. Experienced employees are sharing their skills with their successors and at each production site team members are conducting activities to turn their tacit knowledge into explicit knowledge. These activities have become an intellectual asset to support our current technical capabilities. * The FY2015 employment rate is the average of the ninemonth fiscal period. The culculation scope covers only Nabtesco Corporation. The figures are based on the human resources data. In FY2013, the statutory employment rate of persons with disabilities was raised from 1.8% to 2%. In FY2015, FY2016 and FY2017, we have achieved the 2% rate by actively hiring persons with disabilities as a result of our new graduate recruitment. In April 2018, the statutory employment rate of persons with disabilities was further raised to 2.2%. We will continue to maintain the statutory employment rate by systematically promoting persons with disabilities. In October 2016, Nabtesco Link Corporation, a Group company founded in July 2015, was approved by the Minister of Health, Labour and Welfare as a Specialized Subsidiary Company that is set forth in the Act on Promotion of the Employment of Persons with Disabilities. Since then, Nabtesco Link has promoted the employment of persons with disabilities and made efforts to arrange the working environment to allow employees to work with a sense of purpose. 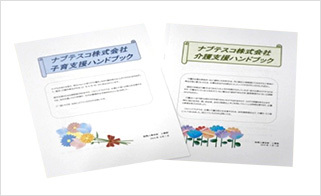 In FY2017, Gifu Prefecture selected Nabtesco Link as one of the model employers for the employment of persons with disabilities in agriculture. The Nabtesco Group will continue its concerted efforts to hire persons with disabilities in order to promote employment in our operating regions. We expect that each employee maintains their mental and physical health, enhances their quality of work, plays their roll at work while feeling a sense of fulfillment and satisfaction, and leads a satisfactory private life at home and in the community. We believe such a lifestyle will develop new values and concepts. Therefore, we have a wide spectrum of schemes in place to promote a healthy work-life balance. In 2016, we set up a special committee of labor and management that aimed to discuss and implement measures to contribute to work-life balance for higher productivity, diversified working styles, and appropriate control over work hours. We recently introduced a teleworking system to encourage our employees to flexibly choose the working time and workplace according to their lifestyle. We will actively participate in the campaigns led by outside organizations* to further promote the prevalence of the system, review it, and discuss more options in consideration of its use. Today, businesses are required to handle more complex working time management with the popularization of mobile terminals and emergence of new working styles. In 2017, we developed a working time management handbook to standardize internal rules and consciousness. The IT-based monitoring function has been partially introduced and a system is being constructed to thoroughly control work hours based on objective recording and suppress excessively long work hours. The labor and management committee regularly monitored and found that the rate of paid annual leave taken by employees reached 76.3% in FY2017 after each employee was encouraged to take four days off during the planned annual leave taking periods of June, July, October, and November. Both the management and employees will continue to promote the use of paid annual leave to elevate the rate of use. We created a childcare support handbook that summarizes childcare-related laws and internal systems to help employees understand the difficult systems in place and undertake necessary procedures more easily. In January 2016, we created a nursing care support handbook to explain the nursing care leave system, which allows employees to take leave repeatedly for up to a total of two years, as well as other support systems and consultation services to provide employees with alternatives to giving up their careers while committing to family responsibilities. Parental leave: Up to two years. This leave can be taken even when the spouse is devoted to full-time child-rearing. Shorter working hours for childcare: Working hours can be reduced by two hours per day until the beginning of the child’s fourth grade of elementary school. Shorter working hours for nursing care: Working hours can be reduced by two hours per day. Nabtesco promotes labor management and related measures based on employee turnover data that details the reasons for leaving the company. The graph on the right shows the rates of male and female employees that retired or resigned from Nabtesco. The rate of employees who resigned for personal reasons has remained around 1%, which shows that Nabtesco provides its employees with a good work environment. * The number of voluntary resignation of executive officers and those who had been re-employed are excluded. The calculation scope covers only Nabtesco Corporation. The figures are based on the human resources data.